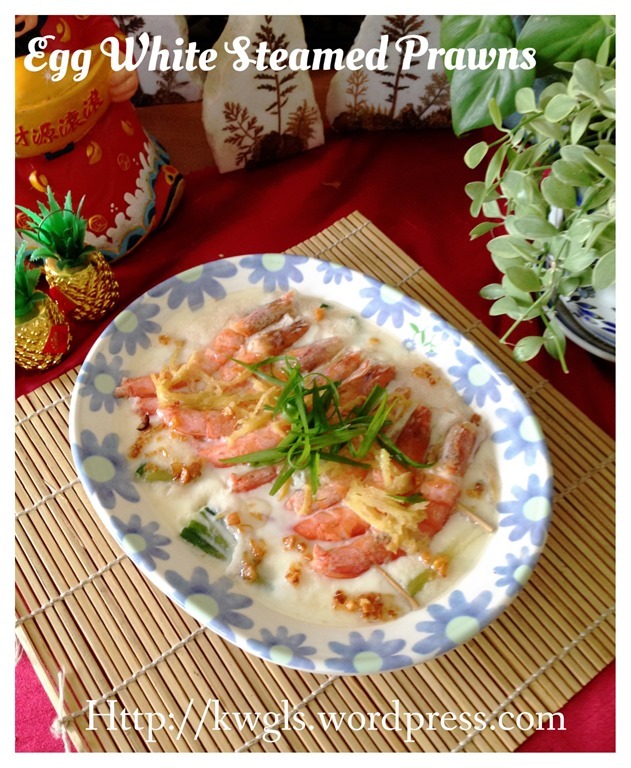 I believed this will be the last Chinese New Year recipe for the year of Horse before ushering the year of Goat – 2015. When one is actively baking Chinese New Year cookies and for my recipe, one recipe portion of kuih bangkit yields 8 egg whites, one recipe portion of pineapple tarts yields 4 egg whites plus egg whites resulting from preparation of egg wash and one lapis legit will yields 30 egg whites. It is no joke if there are no immediate usage of these egg whites. Though it can be deep froze for future usage, however, is it not a better way if we can consume within the day the eggs were cracked? I am facing the same problem too and with my illustration of Authentic Lapis Legit (Spekkoek 印尼千层蛋糕）, the cake left me with 30 egg whites (about 2/3 x 60 grams per egg x 30 eggs)= 1.2 kilograms of egg whites. I have tried to use it to fry rice, preserved radish egg (cai poh nerng) and other savoury dishes.. As the Chinese New Year baking spree started, the egg white kept increasing and I have a container purely to collect egg whites.. The family do not really like sweet western desserts like meringue nest or pavlova and that prompted me to search for egg white recipe. 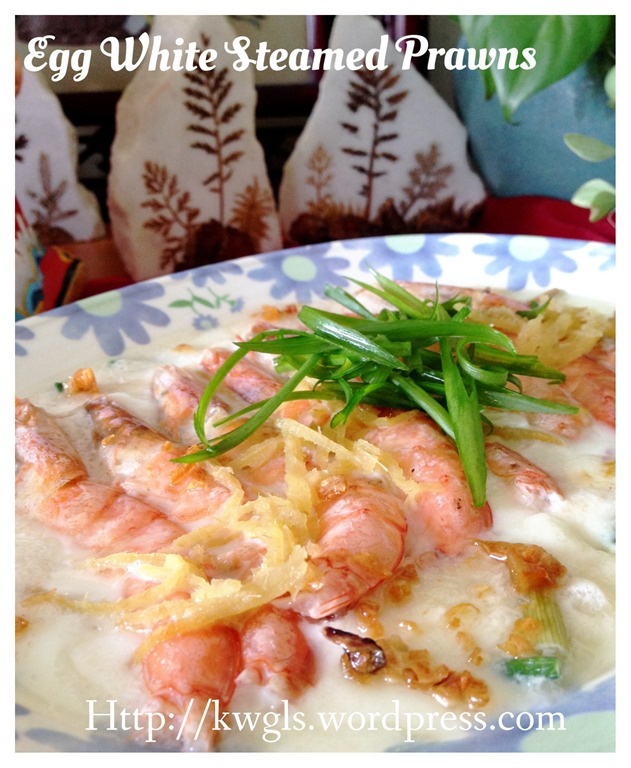 Then I stumbled across a recipe of egg white steamed prawns from Violet’s Kitchen – 酒香蛋白蒸虾Steamed Prawns with Wine and Egg White. After digesting the recipe, i headed to my kitchen and get ready the dish for dinner. 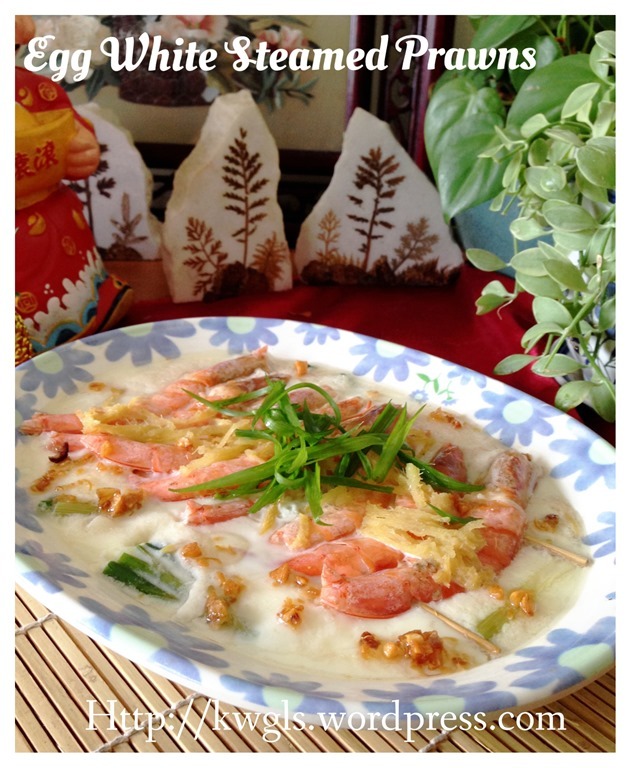 Beside the usage of egg whites, another reason that I have chosen this recipe is because I believed it is a very presentable dish during Chinese New Year reunion dinner.. 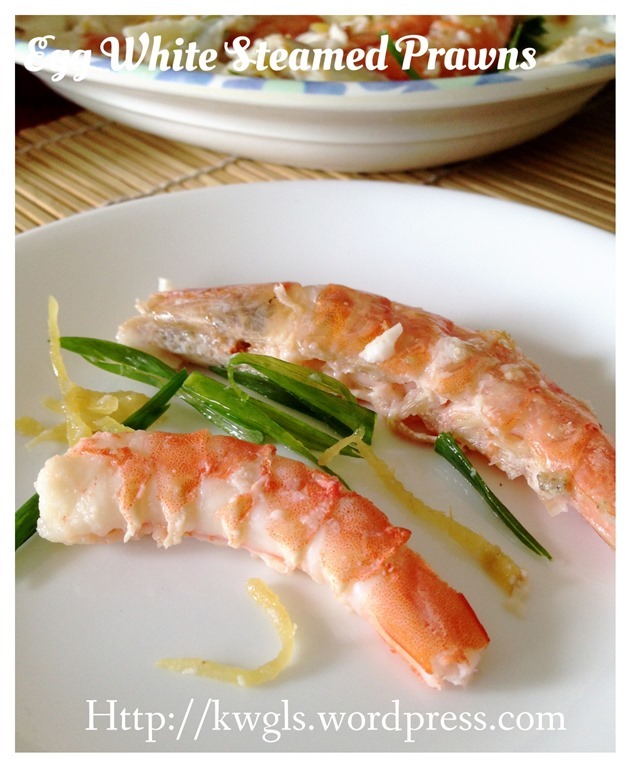 If you want to prepare some prawns for the re-union dinner, why not consider preparing this dish? 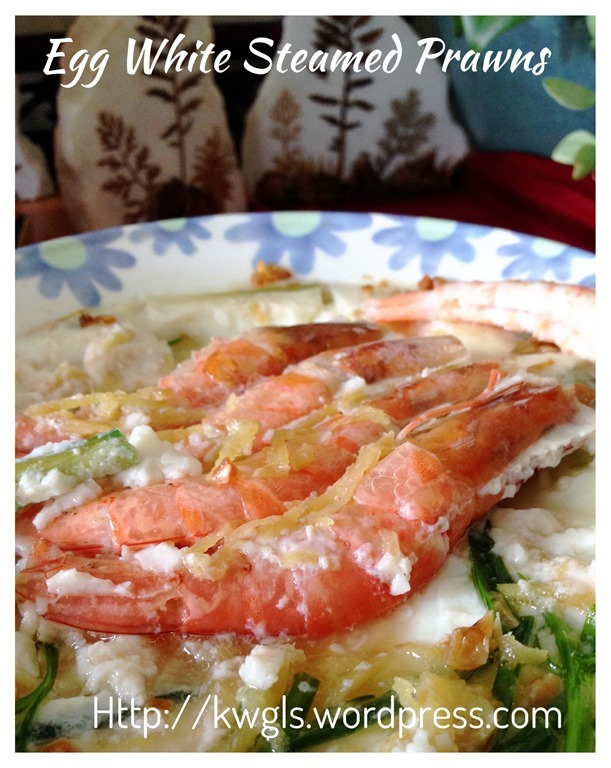 Recipe adapted from: 酒香蛋白蒸虾Steamed Prawns with Wine and Egg White. 1-2 tablespoons of shallot oil. * The amount of egg whites will depend on your steaming plate. If it is deep, more may be required. 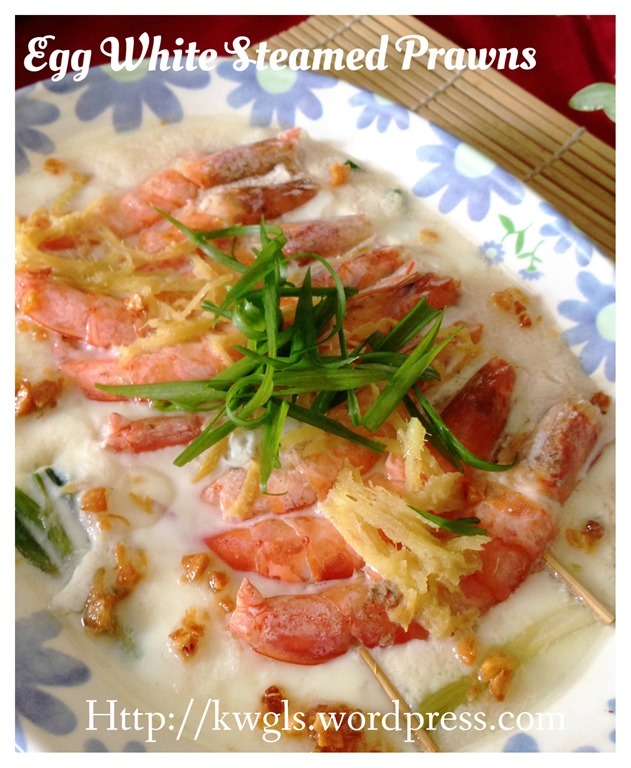 The egg white should be adequate to half covered the prawns. 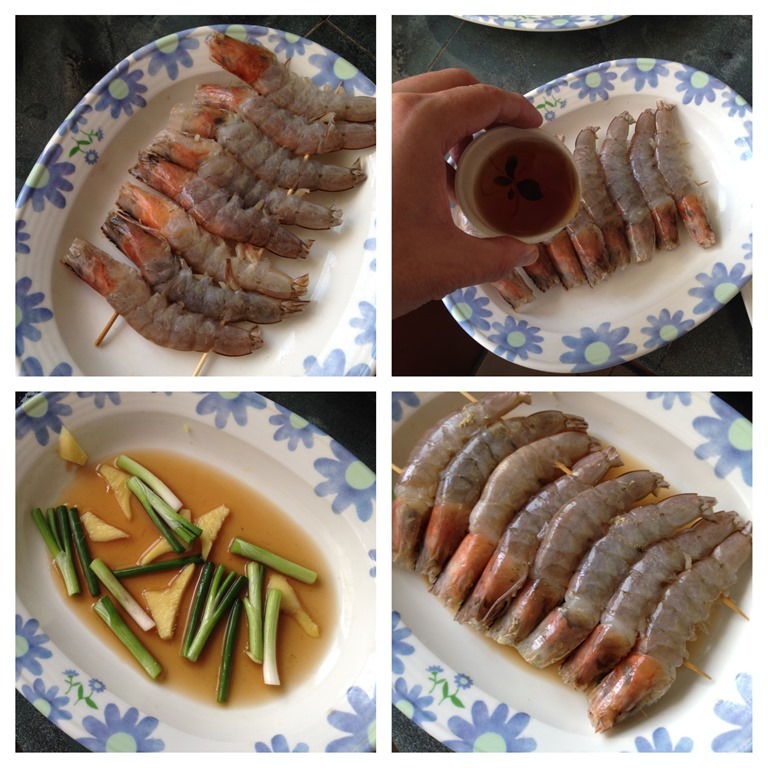 Use two skewers to pierce the prawns near the head and near the tail. 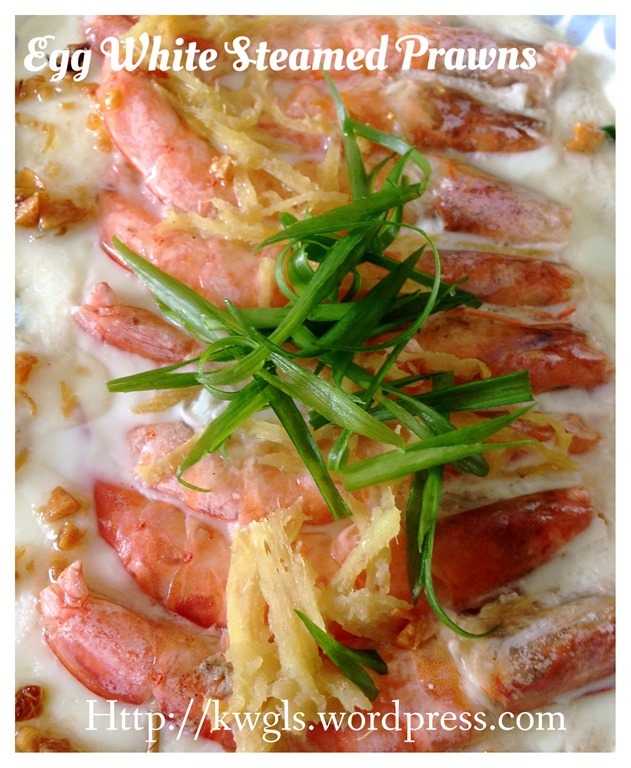 The main purpose is to straighten the prawns after it was cooked. 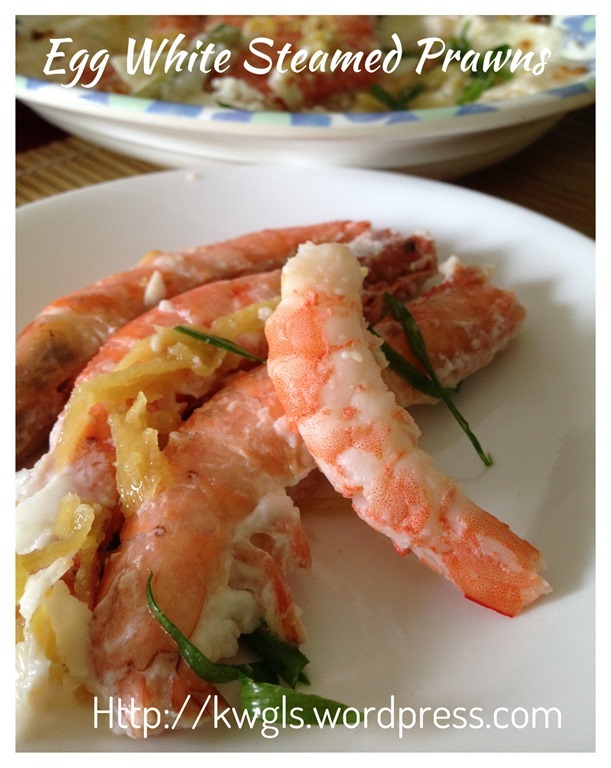 Marinate the prawns with the salt, white pepper and Chinese cooking wine for 15-20 minutes. 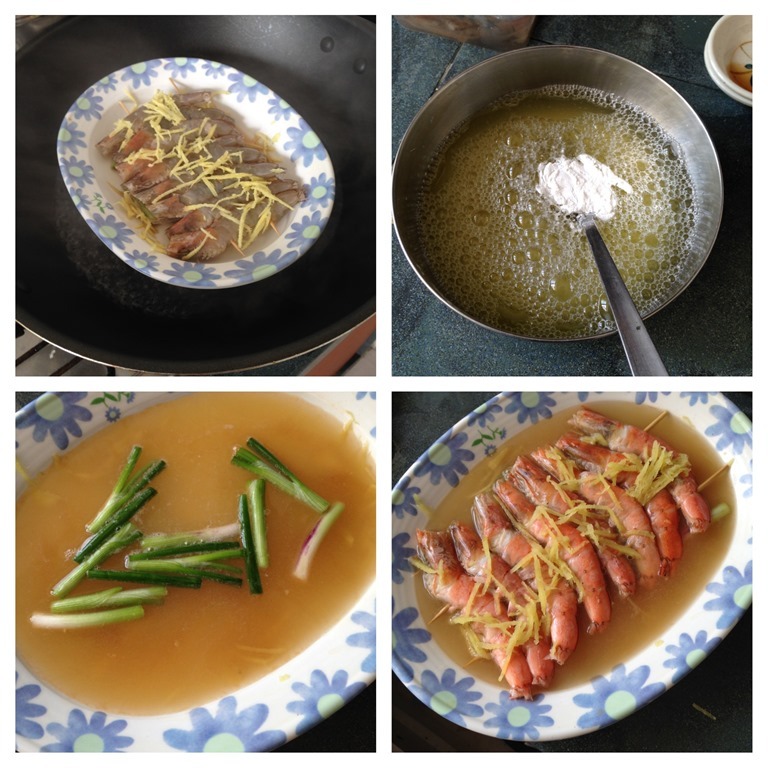 At the bottom of the steaming plate, put half of the shredded ginger, spring onion and the marinating liquid (cooking wine and salt and pepper). 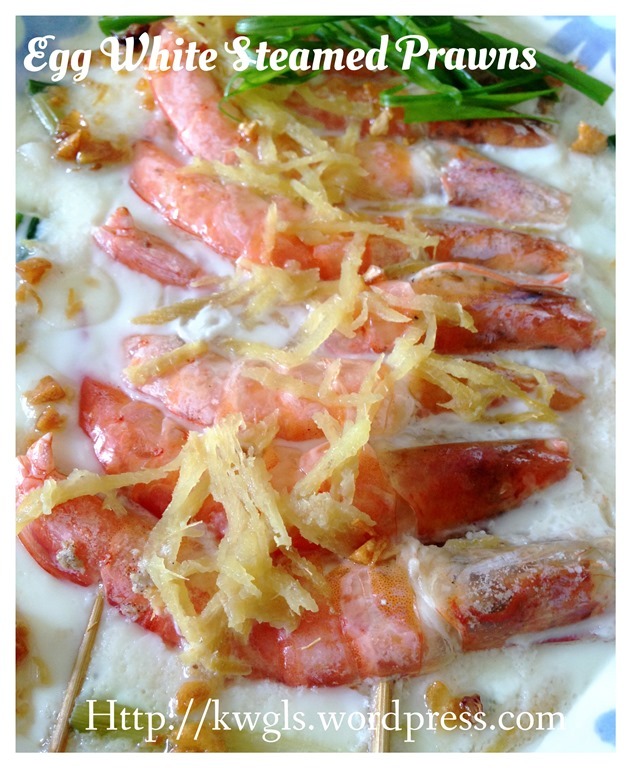 Place the prawns on top.and sprinkle with remaining half of the sprinkle ginger. Steam the prawns at high heat for 4-5 minutes. For egg whites, you can either use only the egg white for steaming or you can add 2 tablespoons of water plus one teaspoon of corn flour, beat until well mix for steaming. 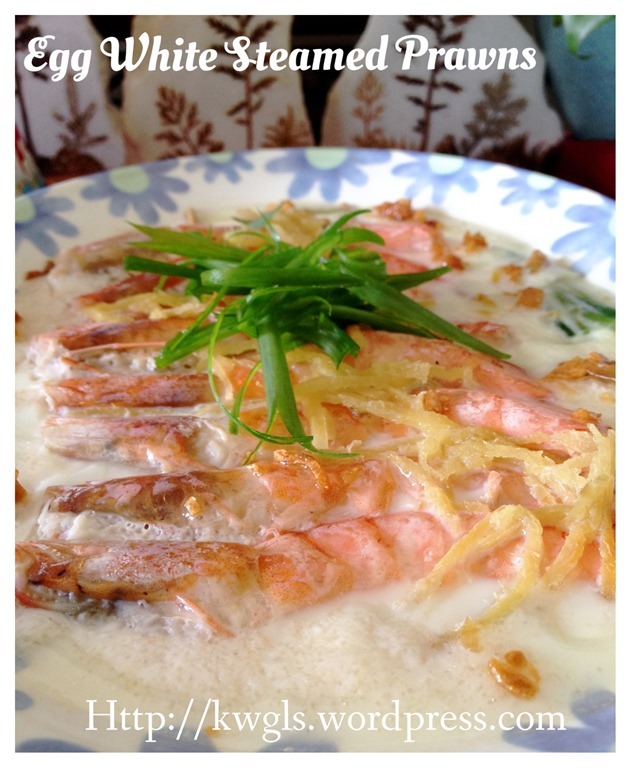 The second method make the steamed egg whites softer but this step is absolutely optional. 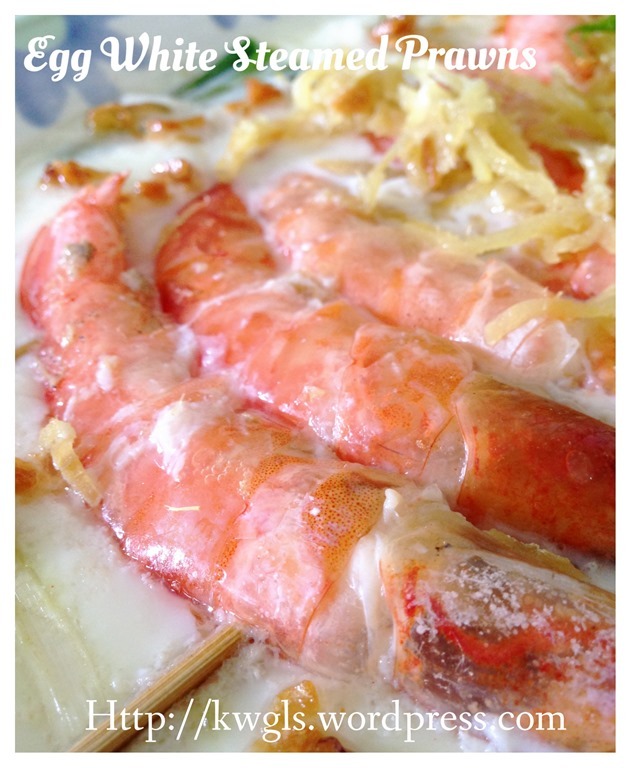 Once the prawns were steamed, pour the beaten egg white to the steaming plate until the prawns are half covered. Steamed for another 2-3 minutes or until the egg white was set. The timing of the steaming will depends very much on how deep is your plate and how much egg whites you have used. Once done, drizzle with hot shallot oil and best served hot directly from the kitchen as part of a Chinese set meal. This post have dual purpose – one is to provide readers to utilize excess egg whites and to provide another choice of New Year Eve reunion dinner. 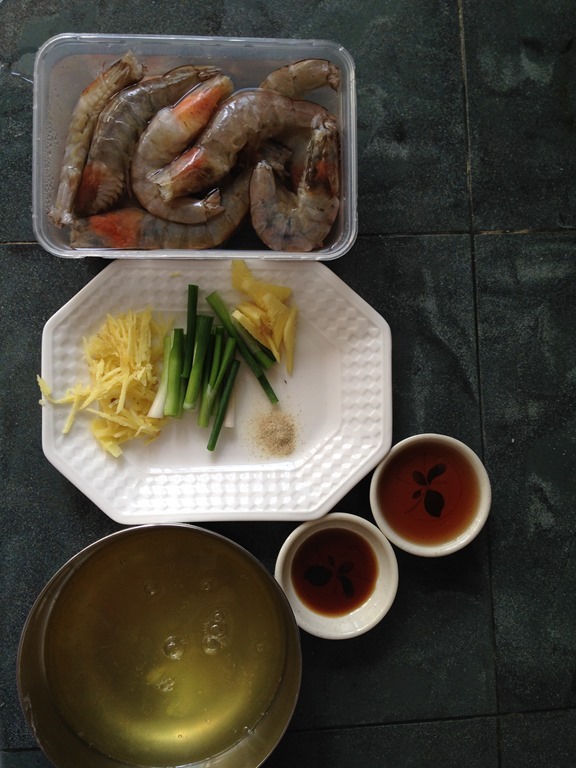 This entry was posted in Chinese New Year 2014, Dish, Food Preparation Series, Seafood Dishes and tagged 8, egg white steamed prawns, 蛋白蒸虾, GUAI SHU SHU, Guaishushu, kenneth goh, postaday. Bookmark the permalink.